In this textile design, Bruce Goold has developed the Bogong moth as a significant (though slightly off-beat as appropriate for a Mambo product) Australian symbol contrasting with his more familiar Australian symbols, the kangaroo, cockatoos and waratahs. 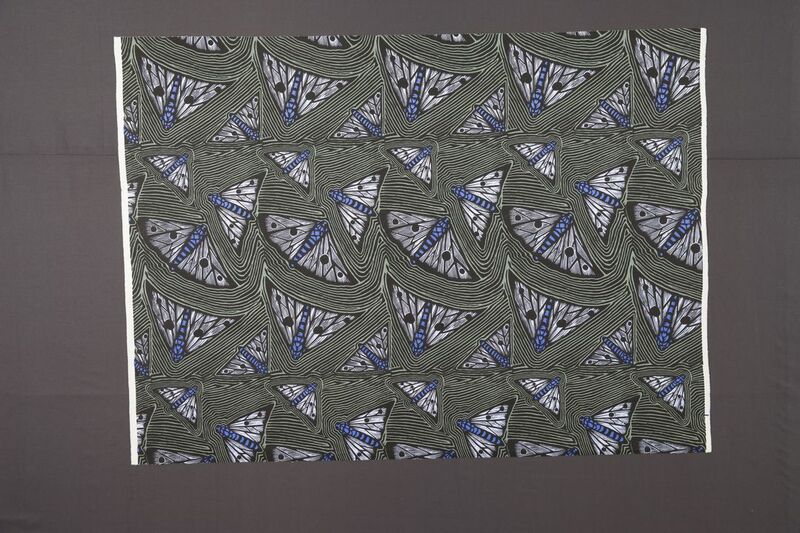 Thickly woven white cotton screen printed with repeat Bogong moths motif, in mauve and blue scattered over a grey green and black background. Bruce Goold was born 1948 in Newcastle, NSW. Initially encouraged by his father, he started drawing and attended Saturday morning printmaking classes. From 1964 studied painting at Newcastle Technical College. A drama festival in Newcastle introduced him to the work of Artaud, Jarry and Schwitters. From 1967 he studied at the National Art School, Sydney. In 1970, he joined Martin Sharp during his exhibition at 59 Macleay Street, Potts Point, Sydney. Goold became one of the longest continuous residents of the renowned artistic community known as the Yellow House where he created the Doors of Perception, and the Belgian Bourgeois Interior in the Magritte Room as well as other installations through the building. Gould was also an active participant in Yellow House theatrical productions. After the Yellow House opened to the public, Goold acted as the vendeuse and as a guide. After the Yellow House closed, Goold worked with Noel Sherican in his shadow play at Central Street Gallery and then travelled through Asia before settling at Palm Beach, Sydney where he started to make linocuts in a style reminiscent of artists of the 1920s and 30s, including Margaret Preston. Goold has held many exhibitions of his prints including in Woollahra, NSW 1979 and Melbourne, Vic 1980. He is represented in Artbank, the Art Gallery of NSW and private collections. He designed the poster for the Bicentennial Festival of Sydney in 1988 in the collection of the Powerhouse Museum (88/423). Textile length manufactured by Woven Image Pty Ltd company of Sydney printed on cotton moleskin cloth made at the now defunct National Textile company, printed by Veronica Textiles, Victoria. This fabric was designed in 1989 and produced between 1990-1998. Gift of Woven Image, the manufacturers - last metreage available of this design as Woven Image no longer produces these furnishing fabrics due to closure of the National Textile company that manufactured the base cloth.